Hero: The definition of a hero varies from person to person, day to day, and age to age. But 10 years ago today, the Miracle On The Hudson occurred and an undisputed hero emerged from the chaos. US Airways Flight 1549 took off from Laguardia Airport, Queens Long Island on a cold winter day. Shortly thereafter the aircraft encountered a flock of Canada geese somewhere around the George Washington Bridge and lost all power. 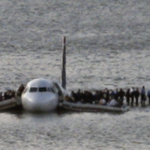 Chelsea “Sully” Sullenberger successfully ditched the plane carrying 155 souls in the Hudson River feat that a National Transportation Safety Board (NTSB) “the most successful ditching in aviation history”. Much has been written about the skill and courage of the pilot and crew in reacting to potential disaster and cooly creating the miracle. Now ten years to the day later, the feat is no less regarded. We salute you Captain Sullenberger and crew!